I got my first UpTech servo today, a CDS5500. Since some of the details about this servo are hard to find, I thought I'd post my findings here. This is everything that comes in the box; you don't get any cables, servo horn, mounting screws, etc. As you can see, it really does basically follow the standard hobby servo shape. 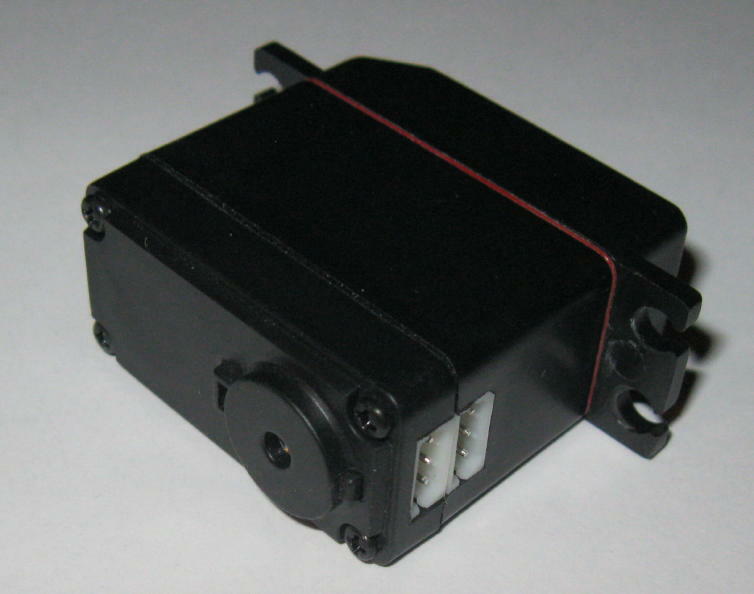 However, it has another M3 threaded mounting point directly opposite the servo spline, as you can see in this back view. Also visible here are the connectors. 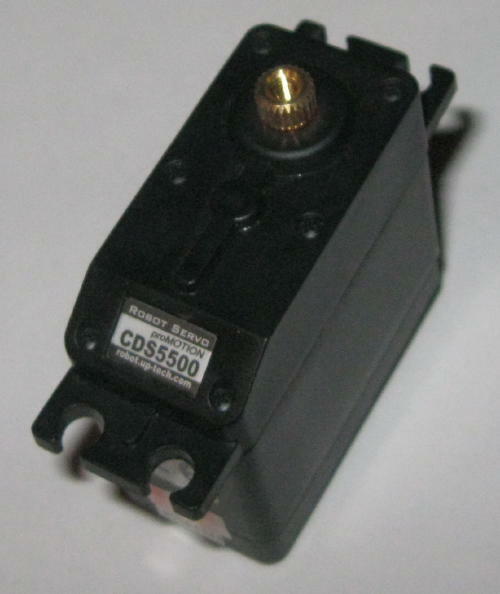 Note that there is an error in the servo data sheet: it says to use Molex 50-37-5043, but that's a 4-position connector, when in fact you want only three. 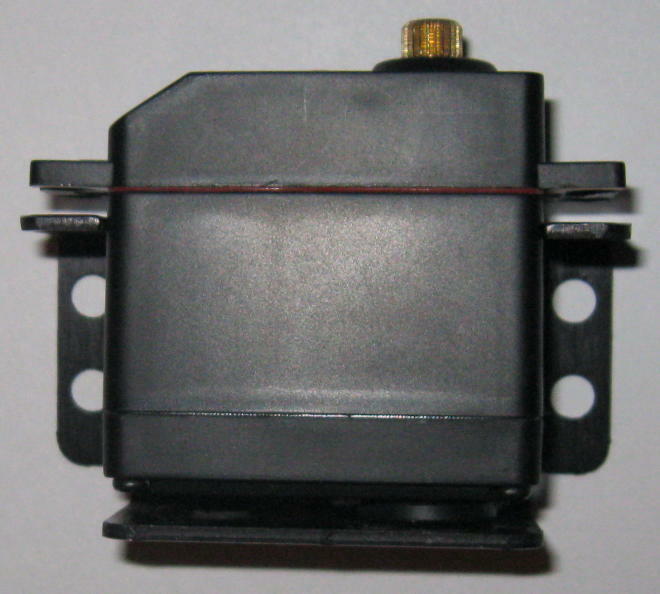 The correct part number is 50-37-5033. There's about a 3mm gap between the servo tabs and the bracket. I suppose you could make it work if you put in some sort of spacer plate, though you'd need to attach with screws and nuts rather than the cool plastic rivet things. Without a servo horn, I'm completely unable to turn the output spline by hand. I also don't have the cabling yet to actually hook this thing up and try it out (though those parts are on order!). So I can't be sure whether the mounting point on the backside rotates with the spline or not. It looks like not, but the manual says "Double-side output shaft." So we'll just have to wait and see. Overall I'm pretty excited about this servo — once we get some cables and brackets made, it looks like it's going to work really well. Update: the output spline is indeed Futaba compatible; and (contrary to the docs) the output shaft is not double-sided. The M3 screw hole opposite the output shaft doesn't rotate with along with the spline. I'm reasonably content with this; the thing to do is screw in a nylon bushing or bearing or some such, and then the other side of the bracket (opposite what's attached to the servo horn) can rotate on that. A true double-sided output shaft would be better, because it wouldn't apply twisting forces to the bracket. But in practice it doesn't seem to matter much, and a convenient idler bearing is about a gazillion times better than nothing at all! Thanks for the review and pictures and please do continue to explore and post. I'm particularly interested in the internals (motor, gears etc. ).